Beto O’Rourke, a Democratic congressman from Texas, lost the election against Republican Ted Cruz for a spot in the Senate. 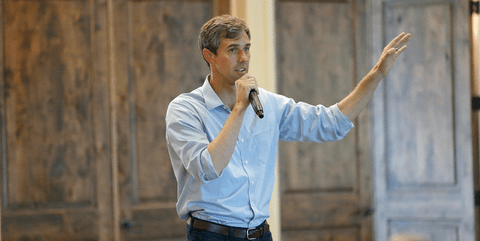 O’Rourke fell about 2.6 percent short of defeating Cruz, and would have become the first Democratic senator in Texas since 1988. Photo from esquire.com. 2018 midterm elections have finally come to a close. No longer should we be afraid to turn on the TV in anticipation of seeing yet another nasty campaign ad. We can all rejoice and answer our phones again without unrecognized numbers popping up daily, asking us who we plan to support in our local and statewide elections. Finally! Random fights with our family about our political differences can end! Yes, we can now expect some peace and quiet for the upcoming year until the 2020 election begins to heat (and creep) up. However, while we enjoy this peace and quiet on our local political airways, some things happened this election cycle that I think must be addressed and recognized. Often times, we look at trends in elections of this magnitude and use them to paint a picture for what the next election cycle might look like. So, while keeping in mind that we are all still recovering from these midterms and all of the aforementioned stuff is finally beginning to cease, I would like to look ahead a little bit and inform you about some of these incredible trends and what they might mean for the future. This midterm election was historic. Historic for a lot of good reasons and unfortunately, even some bad (voter suppression was abundant while some places didn’t want to count each and every vote). As a little recap, this election cycle saw the Republican Party maintain and even gain some seats in the United States Senate to hold a complete majority of the chambers. Meanwhile, the Democratic Party saw a huge revival in the House of Representatives where they picked up a record number of seats (their most since 1974) to win a commanding majority. The Democratic Party also saw a large number of wins in the gubernatorial elections (flipping several states in their favor) and many statewide elections in general. So, what does this all mean on a large scale? For the first time in years, the Democratic Party will have a say in how our government, as a whole, acts and operates for the next two years. The Democrats have not won control of the Senate since 2012 and have not won control in the House since 2008. Like him or not, up until this point, President Donald Trump has not been held accountable by anyone since assuming office in 2016. He has had a completely Republican-dominated Congress help pass most of the legislature that he has wanted to get accomplished without answering to anyone. Now, with Democrats at the table, we will have to see at least some kind of bipartisan legislature if it has any hopes of reaching Trump’s desk. It’s either that or these next two years there will be a whole lot of finger pointing and stalling until 2020. Only time can tell what will happen here and which party will extend the olive branch. I truly hope some good progress can be made. I don’t like to wait around though. I’m a very impatient person when it comes to politics and I always like to be looking at anything that tells me what lies ahead. So, what we can look at and make predictions about now are the facts and figures that made this election so historic. This election had a record turnout for the midterms. For the first time ever, according to Fortune.com, an estimated number of more than 100 million people voted. That means that nearly 48 percent of eligible voters went to the polls this November and made their voices heard! 48 percent might not look like much, but it shows progress. 48 percent is close to presidential election numbers. It shows an increase that the midterms have never seen before, an unprecedented 10 percent increase from 2014. Being the impatient person that I am, I wanted to know why. While there may be countless reasons as to why we saw this spike, I think the biggest reason can be found when we look at young people. According to the Atlantic, young people (like you and me) really turned out at the polls this year. The turnout for voters aged 18-29 showed up in record numbers, an estimated two percent increase from the 2014 elections (again, huge for midterms). The number of early ballots cast alone by young people this year completely eclipsed their total turnout levels in 2014! We saw social media go nuts with election advertisement. Facebook, Instagram and even Snapchat were pushing younger people to register to vote and get to the polls. We saw huge companies such as Uber and Lyft, which are often utilized by younger people, offer free rides and discounts to those heading to the polls on election day. Personally, I drove four hours home (Scranton) after there was a problem with my absentee ballot to make sure that I was part of that increase. The biggest piece of evidence I could find out there to support that young voters really mattered in this election was in the Senate race for Texas. Texas is a deep red state through and through. However, for the first time in thirty years, the Texas youth made some noise and were close to flipping Texas blue. Longshot Democratic candidate Beto O’Rourke came within 2.6 percent of becoming the first Democratic senator for Texas since 1988. How did he do this? An estimated 71 percent of people under 30 turned out at the polls and voted for him. Because of him, countless Democratic candidates across Texas saw surprising wins in districts that almost never go blue. So, where has this surplus of young voters come from? Where were they two years ago? Can we expect another record turnout in 2020? I think we can. I think the Trump administration is the biggest reason why I can make that prediction. Democrat Kyrsten Sinema poses for a photo. Cinema defeated Republican Martha McSally, becoming the first Democrat from Arizona elected to the United States Senate in 30 years, and Arizona’s first female senator. Photo from kfgo.com. According to a Gallup poll, only 35 percent of voters 18-29 approve of the Trump administration as of his 646th day in office. That is a 17 percent difference from President Barack Obama’s approval rating from the same age group at that time in his presidency (52 percent). Trump’s approval numbers are at 36 percent with females, while Obama’s go to 48 percent, 12 points higher in the same timeframe. 19 percent of nonwhite voters are in support of Trump while 65 percent supported Obama, 46 points higher. The numbers are clear. The trends are forming. Gun violence has sparked the youth to get up and vote as we saw the Parkland survivors become politically active and make a difference across the entire country. Two dozen N.R.A. candidates lost their seats this election cycle to Democrats fighting for harsher gun control and many gun control advocates won seats all across the country. The N.R.A. is losing more and more money each day. More and more of the youth have to do with this each and every day. Hate crimes have risen 17 percent this past year, the third consecutive time we’ve seen this happen. Horrendous crimes are being committed against people of color, different faith and those that simply want to live their lives free of constraints. Colin Kaepernick, Black Lives Matter and many other individuals and organizations have voiced their displeasures for this administration and their responses to these crimes. The #MeToo movement has also garnered an abundance of youth support since Trump took office. Recent cases such as Justice Brett Kavanaugh being elevated to the Supreme Court amid sexual assault claims, Trump’s rhetoric towards women, the fear of reversing Roe V. Wade and a very recent case in which one side was using a female’s underwear as evidence of “consent” has been generating more and more anger out of younger voters and it has showed at the polls. I believe it will continue to show at the polls. The disdain for this administration has been building over these last two years and the numbers all support that. This election turnout was just the latest piece of evidence to support this claim. While no one knows exactly what will happen in these next two years, we can speculate. We can speculate using (non-alternative) facts, figures and numbers to make educated guesses as to where these voting groups will be in two years. As of right now, the youth are starting to turn out. They are starting to turn out in record numbers. They are beginning to make big differences in places no one thought possible. A reason for this turnout is that the youth are upset with the current administration and want to see a change. How big will that change be in 2020? I guess that’s up to you.